In memory of Nancy Novak A”H and in honor of the entire Novak family. In honor of Dovid. You rock! I love your "Good Shabbos" text!!! I'm proud that I've joined Raise4ever in support of Camp4ever- the only camp created to uplift the spirits of kids whose parents have life-threatening illnesses such as cancer. I'm working to raise $15,000 to help send children with a sick parent, or who have lost a parent, to camp this summer. I know firsthand how incredible Camp4ever is, because I've attended as a camper for the past three summers. If you know Chai4ever, you know my mom. She was the one at every single event, no matter how sick she was feeling or how draining the chemo was. She was the one talking to other cancer patients, giving them encouragement and advice. She was the one who got up on the Camp4ever buses before they pulled out, and reminded everyone to act in a way that will make their parents proud. She was the one who was happy and energetic, no matter what. She was so full of life that we never believed that the cancer would win. But on November 3, 2018, surrounded by her loving family, she passed away. Chai4ever is literally considered family. We celebrate every milestone together. There was the summer when Camp4ever! crashed my brother Binyamin's bar mitzvah, and the year that Chai4ever surprised us at Aryeh's bar mitzvah, personalized t-shirts and all. There were the suppers and the volunteers taking hospital shifts and the amusement parks and the ski trips. There were the many, many times we went out with our Camp4ever friends and counselors to chill after all the craziness at home. The entire Camp4ever knows us four Novack brothers and our sister Rina. We can proudly say we've gone every single summer since it started, and our friends and counselors have been there for us through the fun times and the hard times. 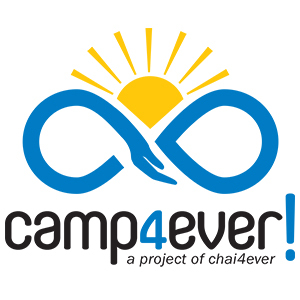 I know what Chai4ever and Camp4ever does for my family and me, and I want to pass it forward and make other kids smile the way that C4E makes us smile. Every kid whose parent is sick, or who lost a parent, should have a chance to go to Camp4ever. In honor of my mother, who was so passionate about summer camp in general and Camp4ever in particular, I am working to reach my goal of raising $15,000 to allow more kids to attend camp this summer. I hope you will help me reach this goal. All donations are 100% tax deductible. Please join me by clicking on the donate button now. Thank you for supporting my efforts on behalf of my own family and all other families fighting illness.